Hello. I'm Sara Shen, Centre Director of Mathnasium of Downsview, your neighbourhood math-only learning centre. We help kids in grades 1 -12 understand math by teaching the way that makes sense to them. 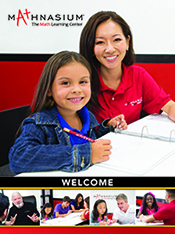 Mathnasium of Downsview has been offering math tutoring and homework help to students in the North York area since summer 2018. We've already helped lots of students learn math and gain a confidence that they (and their parents) never thought possible! But what we do is not magic: It is caring instructors, a carefully structured learning plan created for each student that is neither too hard nor too easy, a positive learning atmosphere, and the contributions of each student that make our Mathnasium work. The best way to see if we are a good fit for your child’s needs is to visit our centre, meet the instructors and try out our program. Book the Risk-FREE Assessment. Call 416-638-MATH (6284) Now! Avoid summer brain drain at Mathnasium! Our summer programs give students an extra boost for the school year ahead. For some students, that means a good, solid review of previous material. Others benefit from previewing upcoming concepts. Most students will get some of both. Check out our Summer Program Promotions! My kid enjoys the sessions very much each time, and more motivated to do math. Great instructors and inviting environment, highly recommended. Open, flexible, organized, caring... And the kids don't seem to mind going! Mateo’s start has been a positive one. Staff at the centre are friendly and corteous with parents and children alike. The centre is very clean and bright which makes it inviting to learn. You also have manipulatives or visual aids that help Mateo visualize and break down math. Amazing staff who represents and implements such a great math policy and procedure everybody can use. My daughter has improved so much in math at school since she began Mathnasium! They do a wonderful job with the kids and take time to explain which is often not possible in a classroom. In just a little over a month, we’ve already seen a difference in our sons approach and attitude towards math. We even received a message from our sons teacher who also said the same thing! We are very happy with his progress with Mathnasium and hope he continues the momentum. We started with Mathnasium just when this new location opened up as well...we have seen it grow as my son’s knowledge in Math growing as well...so far we are very pleased how Mathnasium is helping our son advance in Math. The team at Mathnasium Downsview are fantastic! They definitely know their math but more importantly they know how to teach and pass those skills down to the students. We saw a huge improvement after just a few weeks. They use different problem solving methods than the schools use that is easier to understand. They reward the students on completed work to make it fun too. My daughter has really improved since starting these classes. She also enjoys coming here because the environment is relaxed and pleasant. Sara and her husband are amazing coordinators of the program! While we have only been in the program for a few weeks, my kids are excited to attend and have already learned so much. I am most impressed with their organization and progress reports. Our experience thus far has been wonderful! My daughter has really started to enjoy math and gained confidence in the subject! My only concern is that her attention is reduced at times and she asks for a lot of support when it’s not required. It would be helpful if the staff could deal better with these challenges. My daughter loves to come and asks if she can go everyday! Summer Hours 2019 - Make it a Mathnasium Summer!